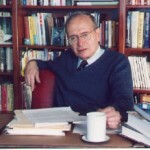 To honor his lifetime of exemplary public service, the SSA Board has awarded the Society’s first Public Service Award to Frank Press, a Director of the Washington Advisory Group in Washington, D.C.
Prof. Press began as a seismologist at Columbia (PhD 1949) and joined the faulty of CalTech in 1955. Three years later he was elected as a member of the National Academy of Sciences for his scientific contributions in a number of areas including earthquake seismology, seismic-wave propagation, crust and mantle structure, and lunar constitution. He became Director of the CalTech Seismo Lab in 1957, and in 1965 he moved to MIT as Chair of the Department of Geology and Geophysics. Recognition of Prof. Press’s scientific leadership soon led to calls for public service, which he answered, joining President Kennedy’s Science Advisory Committee. “Between 1959 and 1963, he represented the United States at four nuclear-test ban conferences in Geneva and Moscow, where seismological monitoring of atomic tests was a key issue. In this assignment he showed consummate skill in handling critical negotiations with formidable adversaries,” stated Milton Dobrin. Immediately following his tenure as Carter’s Science Advisor, Prof. Press served from 1981-1993 as President of the National Academy of Sciences and Chairman of their operating arm, the National Research Council. Prof. Press is only one of twenty National Academy presidents in the Academy’s 152 year history and the only seismologist. He is the only American to have served as both a Presidential Science Advisor and President of the NAS. As President of the NAS, Prof. Press put considerable effort into strengthening the reputation and visibility of the NAS in its mandated role to advise the federal government on scientific and technical matters. During his tenure leading the Academy, Press spoke out on the need for improved science education in the United States and on a number of science policy issues including non-proliferation and better public understanding of science. To draw attention to the value of science research to the nation, he led an effort to define (and hence be able to track) the Federal investment in science. The Federal Science and Technology (FS&T) budget concept was later adopted by OMB in their analyses and thus provided a basis for a national dialog on this investment. Prof. Press worked to be sure that the U.S. scientific enterprise could fund large-scale collaborative research efforts –such as mapping the human genome—and at the same time maintaining strong funding for creative “individual investigator” research programs. Throughout his career Prof. Press has championed the development and application of seismology to the pressing problems of humanity. He played key leadership roles in the establishment of numerous highly successful programs including the International Geophysical Year, the World Wide Standardized Seismographic Network, National Earthquake Hazard Reduction Program and the International Decade for Natural Hazard Reduction. During his long career of scientific leadership and public service, Prof. Press remained committed to science education. He has authored some of the most popular introductory Earth Science college texts in the country, “Earth” (1974, 1986 with Siever), and “Understanding Earth” with Siever, (1998, 2000, 2002) and with additional coauthors, Grotzinger and Jordan, (2003). the Vannevar Bush Award in 1994 given each year since 1980 by the National Science Foundation to persons who contributed most “toward the welfare of mankind and the nation”. Prof. Press remains involved and engaged in the national scientific enterprise to this day. Recognizing the value in understanding earth deformational processes and the potential for a predictive capability, Prof. Press was an early and effective advocate for deployment of a dense array of continuous GPS recorders in a seismically hazardous region. The resulting 250-station Southern California Integrated GPS Network (SCIGN) served as the prototype for EarthScope’s Plate Boundary Observatory (PBO), and significantly, it allowed the U.S. to remain on the cutting edge in taking advantage of new space-based technologies. In view of his lifelong service to the people of the United States and the world, Frank Press is a fitting recipient for the first Public Service Award of the SSA.